TORONTO, July 18, 2015 - Braxton Stone of Canada celebrates after the women's freestyle 63kg final of wrestling event against Katerina Vidiaux of Cuba at the 17th Pan American Games in Toronto, Canada, July 17, 2015. Braxton Stone won 7-3 and claimed the title. 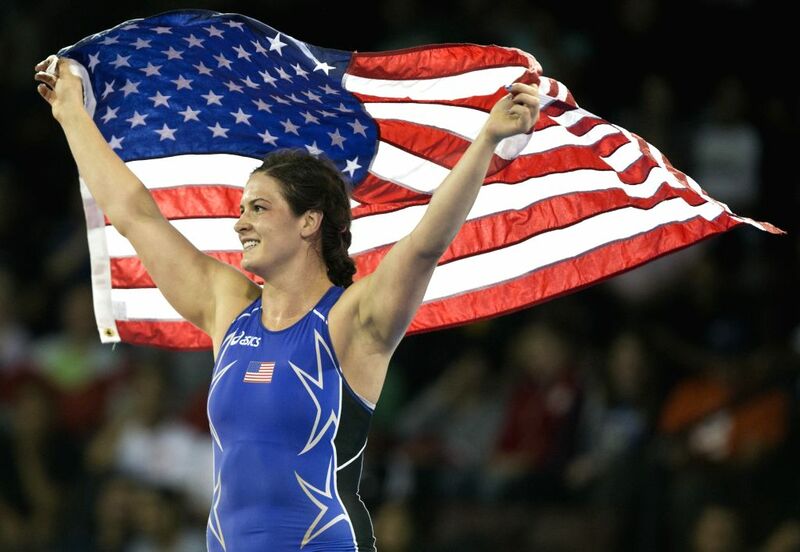 Adeline Gray of the United States celebrates after the women's freestyle 75kg final of wrestling event against Justina Distasio of Canada at the 17th Pan American Games in Toronto, Canada, July 17, 2015. Adeline Gray won 7-6 and claimed the title. Yowlys Bonne(R) of Cuba competes with Angel Escobedo of the United States during their the men's freestyle 57kg final of wrestling event at the 17th Pan American Games in Toronto, Canada, July 17, 2015. Yowlys Bonne won 10-0 and claimed the title. Dori Yeats(L) of Canada competes with Maria Acosta of Venezuela during their women's freestyle 69kg final of wrestling event at the 17th Pan American Games in Toronto, Canada, July 17, 2015. Dori Yeats won 13-2 and claimed the title. Dayanara Rivera(R) of Puerto Rico competes with Diana Miranda of Mexico during their women's freestyle 69kg bronze match of wrestling event at the 17th Pan American Games in Toronto, Canada, July 17, 2015. Diana Miranda got the bronze medal.